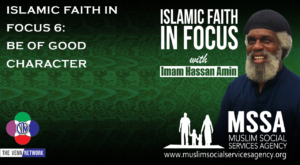 On this week’s Islamic Faith in Focus podcast with Imam Hassan he addresses being Muslim and being of good character. There is a large misconception that seems to surround Muslims and Islam. People have this idea that Muslims only want to do harm to others and to cause pain to those that don’t follow Islam. The truth is, that nothing could be further from the truth! Imam Hassan gives references about the Prophet Mohammed’s (pbuh) character from the hadith. He goes on to talk about how on September 11th 2001 there was this narration in the news that Islam was attacking the United Sates, which simply isn’t true. The fact is that is was a handful of mentally ill people who perpetrated this evil act. After these horrible acts people started to do research on Islam, what is Islam? What do Muslims honestly believe? And once they started to read and do their own research they learned that Islam was a beautiful religion of peace, and not what was being shown on the nightly news. In fact, many people actually started to convert to Islam as a result of their studies.